The 59 police officers of the Yorktown Police Department provide around the clock police protection to nearly 40,000 residents. Located just north of New York City in suburban Westchester County, the Town of Yorktown covers 42 square miles and encompasses the hamlets of Yorktown Heights, Jefferson Valley, Shrub Oak, Crompond, Huntersbrook and a portion​ of Mohegan Lake. Go Social! 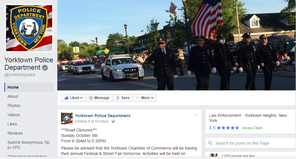 Visit the highly acclaimed official Facebook page of the Yorktown Police Department (NY), where we regularly post valuable information mixed together with some lighthearted humor! The Yorktown Police Department utilizes "tip411", a countywide program to help residents report completely anonymous tips to their local​ police departments. The Yorktown Police Department (and other town departments) utilize Nixle to share Emergency Alerts and Advisory Messages to all residents. Signing up for Nixle is HIGHLY RECOMMENDED! Download your police accident report here!